In recent months, there has been extensive coverage in both the national press and among medieval online communities concerning the discovery and conservation of the late-fifteenth-century wall paintings at St Cadoc’s church, Llancarfan, Vale of Glamorgan. Over the last six years, renowned conservators Ann Ballantyne and Jane Rutherfoord have revealed a number of highly-significant schemes, including Death and the Gallant, St George and the Dragon, and the Seven Deadly Sins. 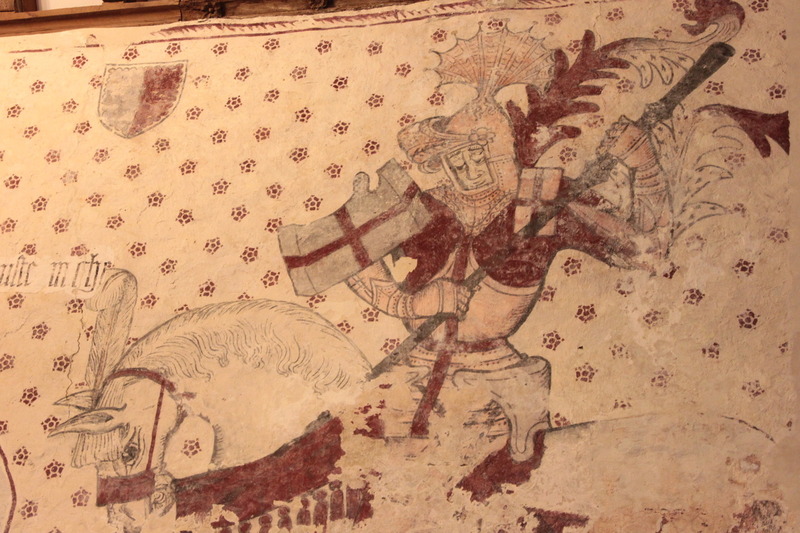 St George and the Dragon, St Cadoc’s Church, Llancarfan, Vale of Glamorgan. Late Fifteenth Century. In a recent video interview produced by the BBC, Jane Rutherfoord explains how back in 2007, she was invited by St Cadoc’s church architect to provide advice on the significance of a thin red line visible below the roof line, the only section of the wall paintings perceptible at the time. The subsequent removal of overlying layers of limewash led to the discovery of two heads belonging to the princess and king, who feature commonly in St George scenes. Also interviewed by the BBC was Dr Madeline Gray, Reader in History at the University of South Wales, who suggests that the image of St George – a figure who medieval parishioners strived to emulate – was deliberately juxtaposed with the Seven Deadly Sins – transgressions which conversely congregations endeavoured to avoid. Dr Gray also sheds light on the Death and the Gallant mural, which depicts a fashionably-dressed young man (the Gallant) dragged into a graveyard by Death, who is portrayed as a rotting corpse wrapped in a shroud. Gules 3 Swan Proper Bawdrip heraldic shield (top centre) and Seven Deadly Sins (detail, left), St Cadoc’s Church, Llancarfan, Vale of Glamorgan. Late Fifteenth Century. The work is funded by the Heritage Lottery Fund, CADW, and local trusts. The project website provides further information about the wall paintings, and includes a discussion of the Gules 3 Swan Proper heraldic shield located above the diminutive Virgin, whose key functions are to bless and highlight the figure of St George. This device denotes the Bawdrip family who lived at nearby Penmark Place from the fourteenth century, and it was no-doubt strategically positioned to ensure enhanced invocation and intercession from the Virgin. The Bawdrip shield also functioned as a symbol of familial status and piety, whose target audiences included earthly visitors to the church and God himself. The insertion of the shield may also indicate that members of the family were responsible for providing funds towards the execution of the painting. 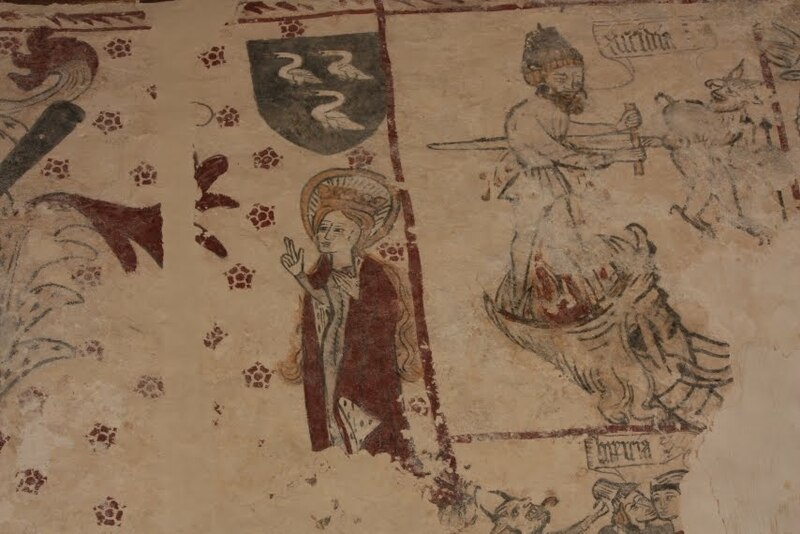 For further details about the iconography of the Seven Deadly Sins in medieval wall painting, readers should refer to the website of Dr Miriam Gill (University of Leicester).